RHYS BOWEN: Jennifer Kincheloe and I met for the first time when we were both nominees for the historical award at Left Coast Crime and I was delighted to meet her heroine, Anna Blanc, who is a West Coast version of my own Molly Murphy. I was happy to blurb her second book,, The Woman in the Camphor Trunk and equally pleased to host her here today. JENNIFER KINCHELOE: Thank you, Rhys! I adore putting historic, horrid-sounding food in my books and making my characters slurp it down. In THE SECRET LIFE OF ANNA BLANC, the characters enjoyed “pink soup with marrow balls,” “wine and tapioca soup,” and “pork cake.” It sounds weird, but this California cuisine is as LA as Anna Blanc. It came straight from the 1905 Los Angeles Times Cookbook, right next to the enchiladas. Don’t ask me what “mayonnaise of lettuce” is. I think history has mercifully forgotten. In my new novel, THE WOMAN IN THE CAMPHOR TRUNK, Anna Blanc returns to solve a murder in Chinatown while facing severe nutritional challenges. Her rich father has tossed her out on her ear, and the girl can’t boil water. Mind you, this was before YouTube videos and, back then, cookbooks were for people who could already cook. No more mayonnaise of lettuce for Anna. She lives off canned kippers and Cracker Jacks. And while she’s fighting crime in Chinatown, she gazes longingly through the windows of the local chop suey joint. Chop suey (pronounced "shap sui," in Cantonese) came to the US with Chinese immigrants seeking their fortune in gold country in the 1870s. It was a peasant stew made of chopped bean sprouts, cabbage, gizzards, liver, lungs, pig’s tripe, dragon fish, shrimp, pork, chicken, or whatever else they had on hand. Reportedly, it was good. 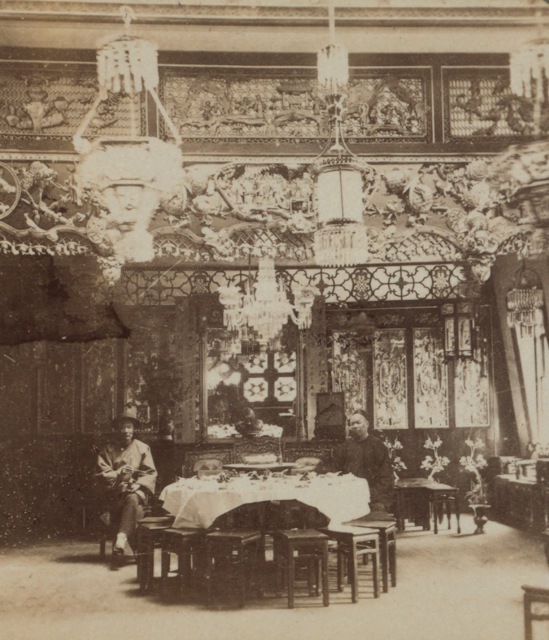 By the 1900s non-Chinese customers were eating chop suey in Chinese restaurants, which adapted the dish to their new customers’ tastes. Chop suey made its way into the home kitchens of white America and morphed into something unrecognizable. The real recipe awaits you below. Note: Anna could not actually cook this. Los Angeles, 1908. In Chinatown, the most dangerous beat in Los Angeles, police matron Anna Blanc and her former sweetheart, Detective Joe Singer, discover the body of a white missionary woman, stuffed in a trunk in the apartment of her Chinese lover. Her lover has fled. If news gets out that a white woman was murdered in Chinatown, there will be a violent backlash against the Chinese. Joe and Anna plan to solve the crime quietly and keep the death a secret. So does good-looking Mr. Jones, a prominent Chinese leader who has mixed feelings about helping the LAPD and about Anna. Meanwhile, the Hop Sing tong has kidnapped two slave girls from the Bing Kong tong, fueling existing tensions. They are poised on the verge of a bloody tong war that would put all Chinatown residents in danger. Joe orders Anna out of Chinatown to keep her safe, but to atone for her own family's sins, Anna must stay to solve the crime before news of the murder is leaked and Chinatown explodes. For guy chop suey to serve six persons, you will need one young chicken, cut in pieces utilizing all the giblets, a pound of water chestnuts, two pounds of bean sprouts (if you can't get these you may use French peas, tender string beans or, asparagus tips), a little sliced celery, sliced onions. The water chestnuts should be shaved thin. Have a kettle with olive oil or peanut oil; about six tablespoonfuls, and sauté in this the chicken, onion, celery, and chestnuts. When almost tender, add the bean sprouts, which, must not cook too long. If you use string beans instead, chop very fine and sauté with the other vegetables. Stir frequently to prevent burning, adding if necessary a half cup of boiling water. When tender I drain of any liquor remaining. Add a little flour to thicken and salt to taste. At the very last, add a teaspoonful of the Chinese condiment, brown and piquant, known as “see yu,” which corresponds to our Worcestershire sauce, and pour over the chop suey. Stir together and serve with rice. Message me on Facebook and let me know me how yours turned out! 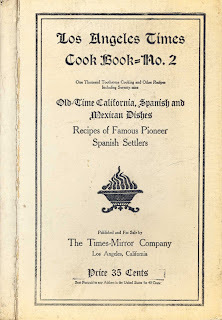 If you’d like your very own copy of The 1905 Los Angeles Times Cookbook, just sign up for my mailing list at www.jenniferkincheloe.com. Cooking is certainly different in Anna’s day . . . I’m not too sure about the pink soup [what makes it pink?? ], but most of the menu items sound quite tasty . . . . I think I will pass on those 100 year old delicacies. But I am going to have to add our books to my TBR pile. I love this! Isn't it fun to go scavenging for really old recipes? When I've done that for the late 1880s, I found recipes with huge quantities, a white chicken stew that turned out to be really insipid when I made it, and Election Cake. I can't wait to read your new book. Thanks Edith. Yes, I think cooking has come a long way. I'm not nostalgic for the food of my childhood, that's for sure! Those instructions sound like the ones my grandmother used to give me when trying to explain how she made some family favorites--"Keep stirring until it looks like it's going to set . . . " If you've never done it before, you have no idea what that looks like, or at least I didn't, because it never set. Congratulations on the new book, Jennifer. The setting and the characters sound delicious! Old cookbooks are a great read--and Anna sounds like someone I need to get to know! She reminds me (in her lack of cooking skills) of a favorite aunt's frantic phone calls to my mom: "But my (fill-in-the-blank) won't set, is lumpy, isn't done, burned....help!" Many of my favorite family memories revolve around food-- both the delicious and the disastrous. that menu rates 5 stars in my book! But I'd be full quarter of the way through. Did they do doggie bags back then? Anna, love your sense of humor. Congratulations on the new book. And that recipe sounds pretty good, if you could nail the last bit which is a bit hand-wavey about "Chinese condiments" - My go-to mixture is soy sauce, hoisin, water, rice vinegar which is good on anything. That sounds really good! I don't think they did doggy bags back then. Maybe the servants took the extra home, or fed it to the pigs? Looking forward to reading your new book, Jennifer! My grandmother used to make something she called American Chop Suey. Later, in school it was called goulash! That's exactly it! With pasta and tomato sauce. I have a cookbook by Jane Grigson called Good Things and it's not ancient -(or no more than I am) from the 70's and she has an entire chapter on celery which she calls one of the most versatile winter vegetables One of her recipes for an appetizer involves filling celery with butter and sprinkling salt on it so I'm not sure I'd trust her judgment but I was surprised. Bookwoman, I remember Mother eating radishes with butter and salt when I was growing up. This popped into my head this summer with lovely, but very hot, radishes from the farmers' market. Yummy! and killed the too much heat. But celery -- with butter, not for me. Thanks, and I'm with you on the stewed celery. What a fun read! Congratulations on the book. I have a 1905 cookbook from a thrift shop - it's marked volume 5 and it has a recipe for an exotic new dish just reaching our shores called macaroni. It notes that you can buy it in some stores. Have to look for the marrow recipes. This sounds like fun! Where did you get your names for the tongs? Hop Sing sounds suspiciously like the cook on Bonanza. The Hop Sing tong are the real deal, and get this -- they still exist and had an office one mile from my house until it was raided for illegal gambling and a bunch of people got arrested. Hmm, marrow balls, eh? In pink broth? No, thanks. But I think the Mayonnaise of lettuce and grapefruit is just grapefruit served on lettuce, with a dollop of homemade mayonnaise on top. My husband grew up thinking mayo was the best dressing, ever. At least the menu didn't include aspic, which was a staple of American fancy cooking for decades. I remember having some in the late 50's, when my grandmother took me to a fancy luncheon at her church. Salmon croquettes (canned salmon back then), and tomato aspic, which I thought would be sweet, not the savory "salad" it was. Matter of fact, this is probably why Grandma stopped inviting me to those soirees, my over-the-top reaction to that stuff! Yesterday there was a list of the top 38 American restaurants on Facebook. I noted how many different cultures were represented among them, and decided that we humans have more culinary variety available to us right now than we ever have. Isn't it fascinating, what human beings have chosen to cook, serve, and eat? For food, this is the best time ever! (So far) I love food from other cultures. My most exotic to date - "Burmese" food. Someone posted a photo of your book on Instagram. I follow many bookstagrammers. I had one question about Anna Blanc. Is Anna Blanc Chinese-American? I was not sure. Hi Diana. Thanks for your question. Anna Blanc is French American. There are Chinese American women in the book, but not the protagonist. American protagonist. But Anna Blanc was born (in my mind) before I really knew anything about Chinatown. And the LAPD was all over Chinatown. So much so, at times it was almost like an occupation. And Congratulations on your Anna Blanc books! Welcome, Jennifer! I had no idea about the origins of chop suey in the U.S. Thanks for that tidbit. My grandmother made American chop suey, which consisted of ground beef, macaroni, onions, tomatoes, and I can't remember what else. Unfortunately, no one in the family seems to have kept the recipe. Have you tried making any other recipes from the 1905 cookbook? Any winners? Ingrid, that sounds more like Johnny Marzetti. Which was a very popular dish back in the 50's, and my father-in-law's favorite. I had to learn to make it, so was very grateful to find my mother-in-law's recipe after her death. I think I'll need to get that recipe from you, Karen! I think it's in a Word doc file. Email me at k Maslowski at fuse dot net and I'll send it to you. No. I'm planning on doing a test kitchen thing, and trying a few recipes out. The one that really intrigues me is actually a perfume recipe. Thanks for sharing this! So appropriate in the run-up to Thanksgiving, when food articles are everywhere. I love food history,tend to acquire cookbooks, and have a Fannie Farmer cookbook from around 1900 with hand written recipes tucked in. A real connection across time feeling to that. Looking forward to getting to know Anna Blanc. I'm so jealous!!! What have you made so far? I'm going to try that recipe in the next couple of weeks, after dividing everything to have it work for two people. The "guy" chop suey will work fine for me; is the recipe for "gal" chop suey different? :) Well since 95% of the residents of Chinatown were men (the women were not allowed to immigrate), it's not surprising it's guy chop suey. I am so thrilled to see you here on Jungle Reds today, Jennifer. (Side note: Jennifer is one of my favorite people as well as authors.) 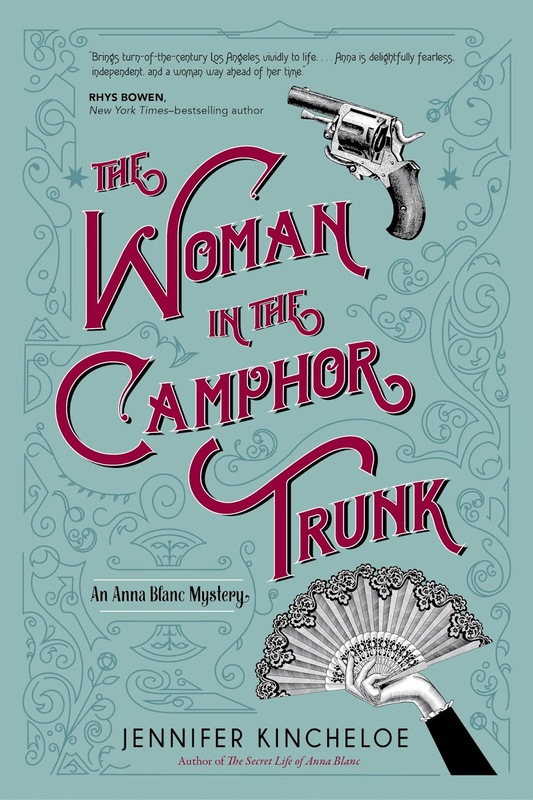 I fell in love with Anna Blanc in The Secret Life of Anna Blanc and am finishing up The Woman in the Camphor Trunk today, with a review to follow. It seems that my life is running one step behind these days, as my plan was to run the review yesterday. With physical therapy for my leg/hip/back and the pipes problem I'm having, I am a bit overwhelmed. They have started replacing the pipes this morning, and there will be drilling at various locations throughout the house. Yes, I took a Xanax. But, the upside is that I have nothing to do, besides worry, but read and work on my reading blog today. 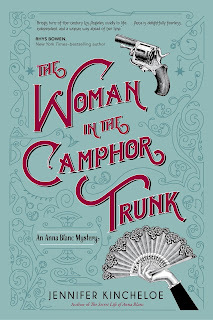 And, back to The Woman in the Camphor Trunk, I am so impressed with the cover. Awesome plus! You have such great story and characters, and a fascinating period of time for a woman striking out on her own. What's not to love! I have been worrying about Anna's diet or lack of in this new book. Cracker Jacks and kippers are not a nutritious food plan. I keep hoping that her father will have a change of heart and give her at least a little money. Of course, it would help if Anna could learn to boil water. Hahaha! Maybe the sing song girls will cook for her. I feel like this book is really taking off, Jennifer, and thus, the series. Congratulations on another outstanding book! Kathy, good luck with the pipes! Thanks, Debs. They should get most of it done today, fingers crossed. Jennifer, I have had several people ask about the Anna Blanc series. It is making all who read it a happy reader! Jennifer, what fun! I'm going to start with the first Anna book so that I'll be caught up on her story. Love the time period, love the menu and the recipes. My grandmother and mother made Chop Suey and I think it was quite close to recipe you posted. I remember chicken, celery, and water chestnuts, but I have no idea what was in the sauce. And there were always some of the little dried chop suey noodles to sprinkle on top. Anyone else remember those? Thanks Deborah. I hope you enjoy the books. I used to love those little noodles when I was a kid! PS Still struggling to wrap my tongue around Bing Kong tong. Sounds like something my German shepherds would like to chew on. Were those real tongs? Yep. Real LA tongs. I'm not sure how Bing Kong tong sounds from the lips of a native Chinese speaker, but that's how it was written in the English language newspapers. I forgot to comment on the chop suey. Thanks so much for the history! When I was growing up in So California, we got Chinese chop suey in a can, with those dried yummy crunchy noodles to go on top (yes, Debs - of course!). I liked it, but it was probably mostly MSG. In the 50's my mother served us dishes she found in a La Choy recipe booklet, using their canned Chinese vegetables and those crunchy noodles. I believe her version was made with canned tuna -- so it was a frequent Lenten dish! Canned tuna???? We are just plain better at food now. I think the mayo lettuce grapefruit thing was a poorly described salad. They had citrus trees and probably came up with novel ways to use the fruit. You get tired of it when you live next to a grove of oranges, or lemons, or grapefruit...I know because I grew up surrounded by it in Southern California. Me too. I'm from Ventura (lemon capital of the world), but I never did get tired of lemonade. My step-grandmother's chop suey was very similar to the stuff Chun King sold in cans - but better. We kids blew her mind when our request for the next morning's breakfast was more chop suey. A treasured "heirloom" from her is a ca. 1949 charity cookbook, with super recipes for treats like "Swanky Frankies," and composed salads featuring bananas and raisins AND helpful household hints about cleaning your iron and freshening the veil on your hat! It was! We also - routinely - confounded my grandmother by eschewing her homemade pies with the woven lattice crusts in favor of "more bread and jam, please!" for dessert. She made wonderfully eggy dinner rolls and the jams, like the pies, were from wild fruit she'd picked herself. When I first married the older women gave me recipes with cool whip, jello or cream of chicken soup in them. Every darned recipe! And I remember friends and I entertained the bursar at college with our version of Chinese food. She was very polite! Every once in a while, when I'm feeling nostalgic, I'll make one of those cream of chicken soup or jello recipes. But they never taste the way I remember them tasting as a kid. They taste like the 1970s. Sorry everyone for my delayed comments. It wasn't for a lack of trying. Evidently, I had a cookie problem. All is fixed now :). I'm so delighted to have been on Jungle Red Writers!!! I would love that chop suey. I'm a protein and vegetables girl. If you find the recipe, would you post it on my Facebook page?